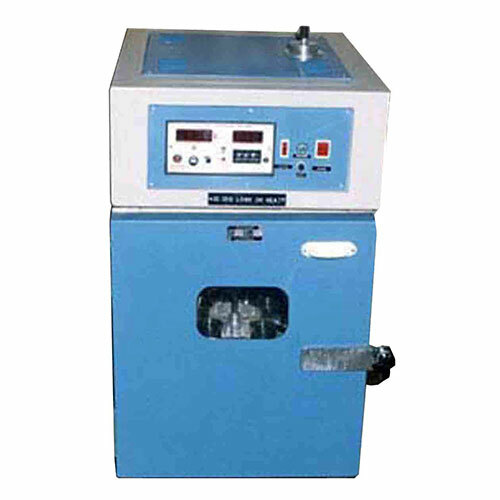 Loss On Heating / Thin Film Oven Description: SE-Test India Pvt. Ltd., a pioneer manufacturer, supplier and exporters of lab testing equipment, believes in following the consistency and uniformity in their products which serve the diverse needs or requirements of the different clients of different industries. SE-Test India’s Loss on heating thin film oven test equipment, model no. 1318, confirms to the BS 2000-45 ASTM D6, D 1754 AASHTO T 47, T 179 industry standards, is used for testing the loss of heat and thin film test for asphaltic and bitumen materials. The Loss on heating thin film oven helps to determine the effect of heat on the asphaltic materials in the oven under pre-defined conditions. It provides accurate results in terms of the changes happen to the sample mass or its properties. It is a dual purpose oven and helps to determine the loss in the weight of flux and bitumen oil along with the effect of air and heat on the asphaltic materials. It is insulated heavily with a double glass door to view the test chamber thermometer and samples. Comes with a variable temperature controller and thermostat to control the temperature at 163° C ± 1° C.
Two rotating platforms, one for the loss on heating test accepts 9 standard penetration cups and another for the thin film test that accepts two 140mm diameter test pans. With the help of external motor platforms can be rotated at 5 to 6 rpm.